Thaddeus Harrell is a labor and employment attorney who protects employer's interests. He advises employers on all aspects of the employment relationship, spanning from hire through termination, disability considerations, misclassification issues, employee misconduct and other disciplinary matters. His practice includes representing employers in litigation matters, including the defense of claims arising under Title VII of the Civil Rights Act of 1964, the Americans With Disabilities Act, the Age Discrimination in Employment Act, Family and Medical Leave Act, and the Fair Labor Standards Act. In addition to his trial work, Thaddeus handles both appellate and workers' compensation defense cases. Appearing before administrative judges throughout the state of Florida, he has obtained favorable results for his clients before the Florida First District Court of Appeals. 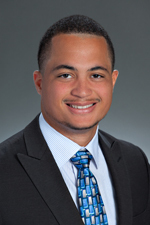 Prior to joining Hinshaw in 2014, Thaddeus was a law clerk with the firm. During law school, he clerked for the Honorable Winston Jackson, EEOC, in Chicago; for the Honorable William Alexa, Porter County Superior Court, in Valparaiso, Indiana; and in the Ft. Lauderdale City Prosecutor's Office, in Ft. Lauderdale, Florida. In his spare time, Thaddeus enjoys spending time with his wife Corniche and his English Pointer named Panda. When not in the office, Thaddeus takes time to travel around the country and enjoys volunteering with local organizations.